Our range of products include Hygienic Conveyors fo Food Handling such as Food Grade PVC Belt Conveyor, Fabric (Canvas) Belt Conveyor, Cold Storage Conveyor, Multideck Cooling Conveyor, Biscuit Cooling Conveyor, Papad/Tortilla Cooling Conveyors, Conveyorized Chapati Making Machine, PU Belt Conveyor, Modular Belt Conveyor, Grain Augers & Belt weighers and many more. Our conveyors can be designed for easy cleaning and washing to maintain hygienic conveying conditions for all foods handling and sorting. Our conveyors are custom designed and fabricated as per the needs of the application and can be customized for dimensions, conveying capacity & loading capacity required according to the material to be conveyed. We have over 30 years of experience in design & manufacturing customized conveyor systems for food handling applications. Our ISO 9001:2008 systems certified workshop is fully equiped with fabrication equipments and is located in Noida (Delhi NCR). Our Food Grade PVC Belt Conveyors are made with hygenic, odor and stain free belts for contamination free food handling. Our Food Handling Conveyors are made with hygienic, odor and stain free Polyurethan (PU) belts for contamination free chemical handling. Our Biscuit Cooling Conveyors use various kinds of belts such as Fabric/cotton belts/pattaBelt Conveyor or Wire Mesh are suitable for hygienic food handling. 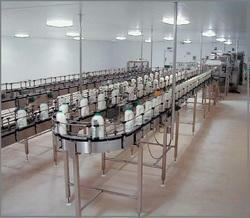 Cost efficient conveyors for conveying light to medium loads. Suitable for high temperature/abrasive applications. For conveying food materials in the food industry, especially bakeries. We manufacture customized bottle conveyors with flexible configuration for any number of horizontal bends and straight flights. Our conveyors provide seamless conveying and transfer of bottles from one flight to another. The conveyors can form a complete bottling line starting from bottle washing, filling, capping, labelling to packing and other operations can be seamlessly integrated with our conveyors. The materials of construction of the belt can be SS or Modular HDPE and the frame construction is of SS for corrosion resistance towards spillage and humid conditions. 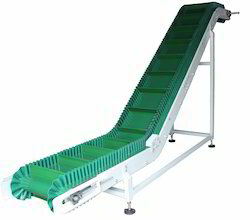 Please send us your requirements for these conveyors. 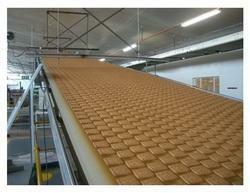 Our Cooling Conveyor Multi Deck provide maximum space utlization for cooling applications. 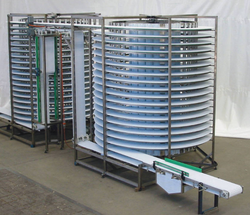 Several decks of closed loop conveyors for optimum space utilisation. Options of natural/forced draught cooling. The Weigh Belt Conveyor is a basic with load cells integrated in the support frame. This allows real-time monitoring of the product flow weight. 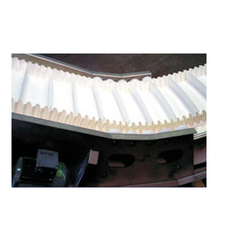 The discharge chute can be modified to meet your given application. The support frame is a heavy-duty construction to promote better load cell performance.